Oxley Nets ‘portable practice nets’ are a temporary, economical, lightweight and functional alternative to more costly permanent netting structures. It's the perfect temporary option for cricket practice nets and golf practice netting. A sports net for backyard use without the need for permanent installation. 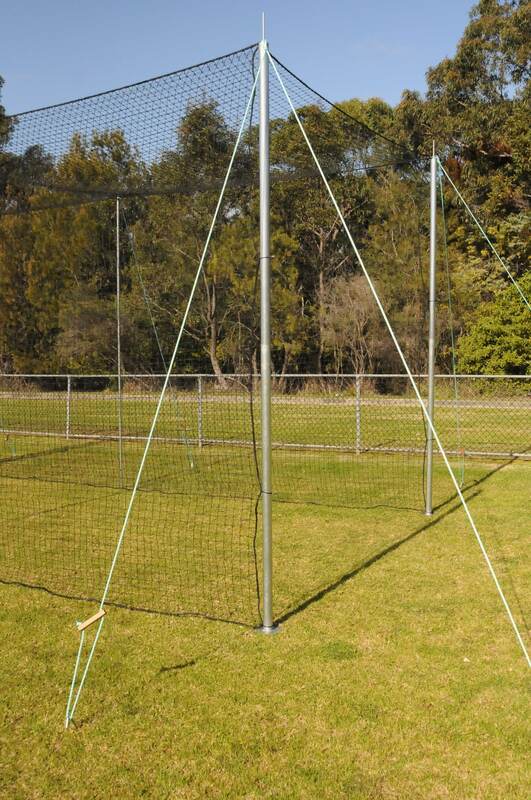 OXLEY NETS portable practice nets are perfect for your budding backyard sports star, the sports club needing additional practice facilities, or school sports activities. These systems are designed to be easily erected and dismantled - similar to ‘pitching a tent’. In the backyard, you get the benefit of being able to dismantle and store everything when not in use. At the end of the season you can reclaim your space and open up your backyard. For sports clubs and schools this simple netting system can add to your current practice facilities and is easily set up in a nearby field, park or where there is enough space. As a leading netting manufacturer and supplier, we can also custom make portable practice nets to suit your specific size requirements. * Additional guy ropes & pegs can be supplied for extra stability, as illustrated in the images above.